That’s no cause for an off-day, however – as he’s shared before, he makes his workouts a priority and considers exercise an “anchor” within his chaotic, globetrotting life. 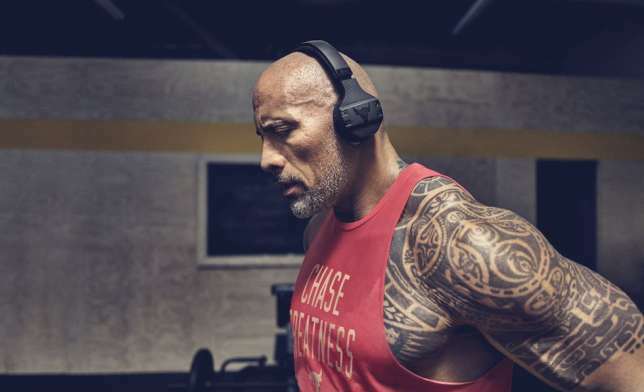 When The Rock takes a work trip, he puts his real work – gym time – first. During Johnson’s last stint in China, we got a look at how he uses chains in the weight room. This time around, he shared an intense chest day banger in a slickly-produced video. The workout he powered through looks to have provided him with a massive chest pump – so we broke it down to give you a chance to try it out yourself. We’re not exactly sure what his set and rep scheme was, so we filled in the blanks as best as possible. As always, make sure to challenge yourself, but don’t keep pushing through the sets if you’re in pain. Your time in the gym is meant to be an anchor to keep your body and mind stable and centered, not dragged down and worn out. Stand in the center of a cable tower machine in a staggered position (with one foot slightly forward). Make sure that each side of the tower is set to the same level (at your shoulder height) and weight. Grab a handle in each hand, then squeeze your chest to pull the two cable handles together directly in front of you, pause for one beat, and control the weight as you return to the starting position. In the video, it looks like The Rock is performing half-reps of the press. For our workout, power through the whole motion with an amount of weight you can handle. Set up a bench in the incline position, and grab a medium weight set of dumbbells. Lift the weight directly out in front of your chest, keeping your palms parallel to each other. Move your hands apart and open your arms with a slight elbow bend to bring the dumbbells to either side of your body, then squeeze your chest to bring your hands back together. Find a stable, elevated surface to prop up your feet. Place your palms on the ground and perform the pushups, squeezing your core and glutes. For an extra challenge once you’ve mastered the movement, do it like The Rock on a medicine ball, with one foot raised off its surface at a time. Focus on recruiting your chest muscles while you use the machine – keep your core tight and your back straight as you control the load.